To provide Singaporeans easier access to insurance policies, insurers in Singapore are constantly innovating. Aiming to change the way life insurance policies are distributed, Etiqa Insurance is the first to bring insurance savings plans online with the EASY save series. But in a country where expenses are high, and retirement planning is not a priority, how beneficial are online insurance savings plans? Women in Singapore face various challenges in financial planning. Despite advancing in our careers, most women are still expected to take the lead when it comes to managing the household. Having multiple roles can be exhausting hence, most women forgo long-term financial planning to focus on their immediate tasks. According to a survey of 600 moms, 75% of Singaporean mothers have not planned for their retirement. Most do not have concrete retirement plans for the future. 44% of the mothers surveyed planned to rely on their children for their retirement. While there have been developments in pay equality across genders, Singaporean women are still paid 10% less than their male counterpart. Women tend to outlive men. These emphasise the need for women to have a well-rounded financial plan. With these challenges in mind, Etiqa aims to help Singaporean women by making saving more convenient and transparent with the EASY save series. The return at maturity is guaranteed at 2.23% p.a. for eEASY save (with upfront premium discount) with 114% capital guaranteed. For eEASY savepro, it is more than 100% capital guaranteed and has a higher projected maturity yield of 4.07% p.a. * (with upfront premium discount). One of the reasons why Etiqa can offer such high projected yields is that online insurance savings plan cuts off intermediary costs. The online and direct business model converts what would have been commission fees for distribution cost into better returns for policyholders. *Returns are 4.07% p.a. and 2.51% p.a. based on the projected investment rates of 4.75% p.a. and 3.25% p.a. respectively. Terms apply. Yearly premiums start at S$10,000 to S$100,000 for eEASY save and S$5,000 to S$100,000 for eEASY savepro. Choose to pay your two-year premiums in one lump sum to enjoy upfront premium discount. It is fully customisable to your needs, allowing those with a limited budget to start saving better. An online insurance savings plan is a great solution for time-strapped women. It takes away the pain of face-to-face consultation with agents. Just choose the product that suits your needs best and sign up online. In addition, eEASY save has a short policy term of 6 years while eEASY savepro starts from 7 years to 15 years. You are free to choose the right plan based on their risk tolerance and comfort level. The plans provide flexibility in the product nature, terms and premium sizes. 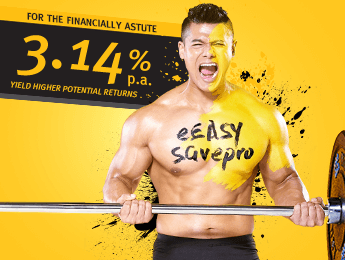 eEASY save is a non-participating product with guaranteed returns while eEASY savepro is a participating product with a higher potential return. There is a death benefit which is equal to 105% of total premiums paid and covers throughout the policy term. On top of this, Etiqa offers a free Accidental Death Protection Booster. This complementary protection is equal to 100% of total premiums paid and covers throughout the premium term. Most insurance products can be complicated and full of jargons. They are challenging to comprehend. The EASY save series is simple and straightforward. The user-friendly website is a joy to navigate too. 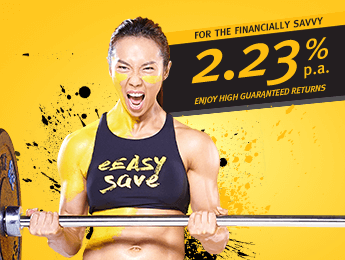 Join our Early Saver Promotion and receive up to S$7,500 worth of shopping vouchers. Limited coupons daily. Learn more today. Best guaranteed return at 2.23% p.a. Our highest potential yield of up to 4.07% p.a. Protecting Singapore since 1961, Etiqa offers comprehensive insurance coverage and solutions with affordable and transparent insurance premiums. These include general insurance, life insurance, and retirement planning insurance plans for personal and business needs. Etiqa is also one of the first insurance companies in Singapore to empower its customers with the option of online insurance. Etiqa is dynamic, progressive, and at the core of it all, committed to humanising insurance – placing people over policies.